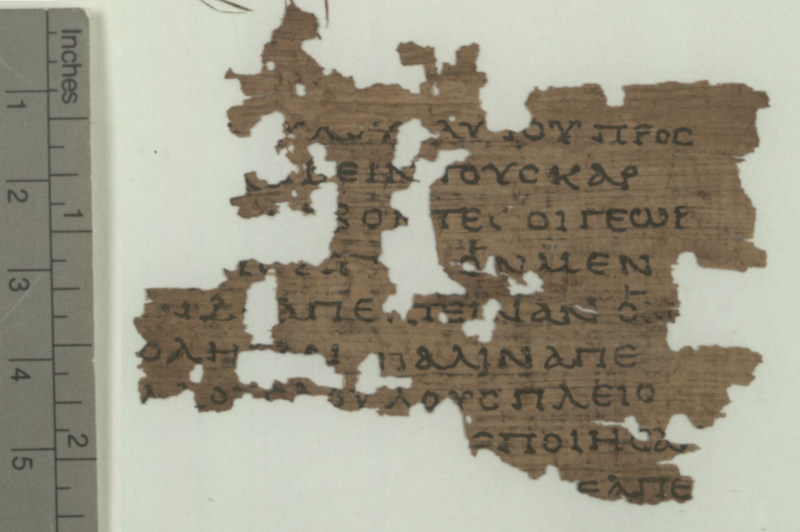 Evangelical Textual Criticism: What is the Oldest Manuscript of the New Testament? What is the Oldest Manuscript of the New Testament? ‘On the whole we may accept with some confidence the first half of the second century as the period in which P. Ryl. Gk. 457 was most probably written—a judgment I should be much more loth to pronounce were it not supported by Sir Frederic Kenyon, Dr. W. Schubart and Dr. H. I. Bell who have seen photographs of the text and whose experience and authority in these matters are unrivalled’ (C.H. Roberts, An Unpublished Fragment of the Fourth Gospel in the John Rylands Library [Manchester: Manchester University Press, 1935], 16). A lot has happened since then in the study of Greek palaeography and with the increase in readily available collections of digital images and refined classification one would assume that the experts are able to form an even more informed opinion now than they were in the 1930s. A 2012 article by Orsini and Clarysse provides exactly this re-evaluation. Their method is solid and responsible, both scholars have a tremendous track record, and in general I don’t find much to disagree with, even though in some of the finer distinctions Orsini and Clarysse make I cannot always follow them. Their evaluation of the date is not far off from what Roberts came up with in giving the range 125-175 for P52. So is P52 still the earliest fragment of the New Testament? Possibly, but looking through the results presented by Orsini and Clarysse there is another candidate, P104, an interesting fragment of Matthew 21, published in 1997. This papyrus receives a date 100-200. Some particular scripts are easier to pin down than others and that is why P104 has a span of a century, whilst P52 only half a century. So we have P52 and P104 both dated by a range that has its median in the centre of the second century (it may be earlier, it may be later). So what is the oldest manuscript? Well, there are two candidates, P52 of John 18, and P104 of Matthew 21; the former oldest manuscript has become part of a double act (two times 52 is 104). **Pasquale Orsini and Willy Clarysse, “Early New Testament Manuscripts and Their Dates: A Critique of Theological Palaeography”, Ephemerides Theologicae Lovaniensis 88, no. 4 (2012): 443-74. In other words, "we don't know". I find it surprising that Brent Nongbri's 2005 HTR article, "The Use and Abuse of P52," is neither mentioned in this post nor cited by Orsini and Clarysse. With a range of new paleographical exempla, Nongbri argues (convincingly, in my opinion) that P52 should be dated to the 2nd or 3rd century. The breadth of this range, while perhaps dissatisfying to some, is crucially important: no matter how skilled the scholar, no matter how many points of comparison are adduced, paleographical judgments on a scale shorter than a century or two will always be exceedingly tenuous. Or, if we're being frank, we might call it a fantasy of scientific precision which does not, in fact, exist. While it is clear that Orsini and Clarysse are skilled papyrologists, isn't it a little silly to argue that a reevaluation of the paleographical evidence could shift the date of an MS by only 25 years? The data simply doesn't admit such a fine-tuned analysis. Excellent post. I found Orsini and Clarysse's work refreshingly detailed in their method of placing the various papyri into established scripts. If I understood correctly, the main point Brent Nongbri was making in his article and his Manchester presentation (I was there too, Ian) is that the time span from which P52 can come should be made larger (to include early third century). He does a lot of good work on a specific manuscript, but I think the nature of palaeography is such that it works best when looking at a whole range of documents written in a particular script and look for a relative chronology rather than compare a single manuscript with others in a search for parallels. Though I think Brent would agree with this, his argument is presented according to the latter method, while Orsini and Clarysse do more of the first. The comparanda Nongri cites in his HTR article on P52 actually show that the script was in use in the second half of the first century as well. So, it would seem that the lower limits, simply on a comparative basis, ought to be extended to the late first century. A file on P104, with image and text-analysis, is in the Files-collection at the NT Textual Criticism group on Facebook. What about the Mark fragment Wallace talked about in 2012? Did it turn out to be more recent? I have no direct knowledge about the Mark fragment. For what it's worth, Owen Jarus on Jan. 18, 2015 reported: "[Craig] Evans says that the text was dated through a combination of carbon-14 dating, studying the handwriting on the fragment and studying the other documents found along with the gospel. These considerations led the researchers to conclude that the fragment was written before the year 90. We must not forget the other important features of the manuscripts when evaluating the date of the codices, such as the absolute dimensions. The size of P52 is approximately 18x22 cm and the pages of P104 are about 14x25 cm. As you might know, scribes preferred pages that were more square in shape during the second century, however, in the third century the fashion changed so that scribes used more often the rectangle-shaped pages. This indicates that P52 might be slightly earlier than P104. Brent Nongbri points out there the relativity aspect means that whole groups of papyri could be dated too early, or, more precisely, with a far too limited range of dates. While the terminus post quem can be fairly accurate (and we know that NT scholars often have a desire to push the earliness envelop), the terminus ante quem is far too early. Instead of 25-50 years, as sometimes presented, many of these papyri should have a range of more than 200 years. Another very important point is the lack of symmetry in papyrological date estimation. Once a script is in use, it can be used, or emulated, way into the future. Even hundreds of years later, and in the case of deliberate replication, 1000+ years later. However, it is very difficult to theorize anybody writing in a a script significantly "early" .. in a sense predating a future writing style. If the script is unknown, no handwriting will be shown. Thus, assigning any fixed terminus ante quem can be rather problematic. Some famous papyri that are considered 2nd-3rd century could be long after Nicea and Vaticanus. And I will point out that if it allowed that P72 should have a similarly wider date range (forthcoming paper by Brent Nongbri) lots of "common ancestor" theories from gentlemen like Gordon Fee and Daniel Wallace lose whatever thin foundation they may have had before. All existing theories, pro and con to the Alexandrian text (both exist), that used the date relationship of P72 and Vaticanus, become virtually irrelevant. Or at most speculative and conjectural. So the implications of allowing dating 150-200 years later than previously pigeon-holed can be rather significant. And not just to the apologetics arguments about early manuscripts, but to the textual criticism theory. The question of external evidences that might corroborate a date is exceedingly important. In correspondence, Brent Nongbri gave as an example P.Ryl. 3.458, where you do have a fairly secure 2nd century date. Steven, are you talking about P72 or P75 (there is no particularly close relationship between P72 and Vaticanus). Orsini and Clarysse date P75 to 200-250, by the way. Their article on "theological dating" is a must read. Yep. My bad. Thanks :). I quickly checked the number and noticed that there was a book "P72 and the Codex Vaticanus" and I let that override my own thinking facilities. By making a blunder a year, it helps my textual humility. The problem is .. we are only in January! Yes, I do agree on the significance of "theological palaeography" is a related part of the coin. Although I don't consider that paper as significant as the Brent Nongbri analysis of P52 and P66 and P75 forthcoming. I hinted at that presupposition stuff with the comment about how NT scholars "have a desire to push the earliness envelope". Yearning for a result can mess up scholarship. Now I consider myself in the evangelical apologist camp, and I I consider these bogus claims around papyri to be a real disaster. On this issue of using "common ancestor" doctrine, I did write about the Gordon Fee and Daniel Wallace flying jumps of perplexity, done solely for the purpose to support the Alexandrian Critical Text, in a few different posst. And hope to expand it into an article. Or maybe, we should not just assume Nonghri is correct just because it's what the latest fad is in scholarly circles since scholars get away with this kinda nonsense all the time! Has anyone seen “First Century Mark”?